What is green brain goop? To me, there are several versions. I'll explain them as best as I can. As a needle pushed through your head. For the past several months, I've had an upper respiratory infection with a sinus infection as a chaser. There is nothing more fun than bending your head down and having this rush of pain rush to your nose and back into your brain. It's as a hot needle pushed from the front of your head to the rear. I finally started round two of Zpack and everything seems to be back to normal. When you blow your nose and nothing green comes out; you cough, as if a lung is going to come up, and, again, nothing green flies out, that's a good thing. Sure, the cough is still there, with some sneezing, but most of the pain is gone. I almost feel human again. The first antibiotic that my doctor put me on had me in a fugue like state, almost like a depression. When you can actually recognize that for what it is, that's a good thing. As soon as I finished it, my brain was clear, once again, and I wondered where I was for that last week. It was a very strange feeling and I hope not have to repeat it. It's not quite like an out of body experience, but almost like it. You know you're not feeling right, but can't do anything about it. 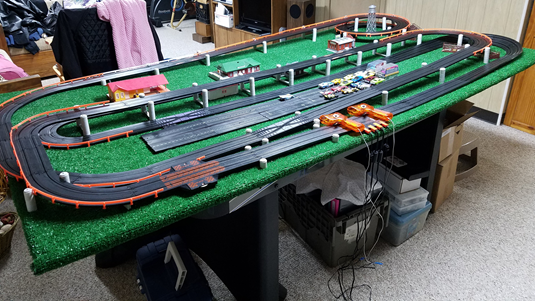 Every Super Bowl Sunday, there is a slot car show at one of our local hotels. It's an annual thing and this is the third year in a row that I managed to attend. I get to see some fellows I've met in the past and make some new friends. The night before, some of us get together in the hotel lobby just to talk, to trade tips and ideas. One of my friends lives in Florida. His specialty is restoring less than perfect HO slot car bodies that our younger selves hacked up or painted badly years before. I had mailed my friend, in Florida, eight car bodies. He managed to repair four of them in time to bring them up with him. One body just needed two supports put on the underside of it, along with repairing a broken window post. The rest he will mail to me as he can do them. Jim is what we call the King of the Goop. He takes a product made by Testors, good old number 3502, and makes a clear or coloured concoction to repair pretty much anything. He'll take a donor piece of plastic and melt it into the liquid and he change the consistency by how much plastic to liquid he uses. This is a talent I don't possess, I can hop up a car by changing out parts and tires; I have no artistic talent, at all. I have a white Jaguar body that had remnants of turquoise paint on it; it was also missing the windshield and driver the wheel wells were pretty hacked up, too. Jim managed to restore the white paint, add a windshield and driver and add wheel wells with goop. He said he managed that by slopping it over silicone tires, which it wouldn't stick to and then shaping them by hand. That was a impressive creative fix! Another HO slot-car body had no window glass in it. I had glued some black plastic screening material on the inside to fill it in. That was a lame idea. Jim said it took him quite a while to get that stuff off and then create the glass for it. The underside looks rough, but I can always paint over that ugly original orange paint. The real winner was a classic Chaparral body that I had painted as a kid, and it just looked gawd awful now. He painted that purple with some decals, and now it looks great. I took Super Bowl Sunday off from work, with the intent of sleeping late, say, until around 8:30 AM and getting to the show by 10. Our three cats had other plans. They woke me up at 7:15 for breakfast. Then I took a shower and had breakfast. I was out of the house by 8:10 am and got to the show by 8:30. I wasn't feeling well. I had a pounding headache and my own green goop trying to escape. Every time I moved my head, it was a new experience in pain. Spending money is very easy at these events. I didn't go crazy, especially, as I was in so much pain. By 10 am, I was done. I got home and took a good two-hour nap. After my nap, I relaxed the rest of the day. Finally, on Monday, I got that refill of the Zpack and I'm now done with it. I managed to work on the HO cars this past Tuesday and it was a lot of fun. It's a great form of relaxation, if I don't feel like doing anything outside of the house. The best part is, when I'm done, I get to run the cars lickety-split around the track!